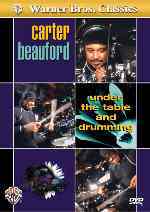 Tiger Bill reviews Carter Beauford Under the Table and Drumming DVD from Alfred Publishing. Carter Beauford, world famous drummer for the Dave Matthews Band, performs along with the rhythm tracks from six of the bands's best songs. Let's check it out. This DVD is divided into Volumes One and Two. In each volume, Carter plays a section of the featured song and then breaks down what he's playing so you can clearly see what's happening. In addition to that, there is a booklet included that contains the written drum parts covering most of what's on the DVD. There is a Special Features section that contains the performances only, minus the instructional portions; teasers from Neil Peart and Zoro videos; and an interactive section detailing Carter's extensive drumkit setup. In addition, putting the DVD into your PC will give you access to additional Internet Features. Carter Beauford is a very creative drummer with ample chops and a deep, funky groove. This DVD provides drummers of all experience levels with detailed insight into many of Carter's favorite grooves and licks. The included printed drum charts are a useful bonus.